Koffler has the nails you need for flooring applications! Great quality TRAXX Ring Shank Wood Nails, Drive Screw Nails, Plasterboard Nails, Roofing Nails, General Purpose Concrete Nails, Heavy-duty Concrete Nails, Extra Heavy Fluted Concrete Nails, and Elasticel (Acoustical) Concrete Nails available. Ring Shank Wood Nails 12 gauge ring shank nails have optimal holding power in wood floors. The wood tightens and grips the barbed rings as the ring shank nail is driven into the wood. The countersunk head sinks the nail to create a flush substrate. Great for use with tack strips, underlayment installations, and reinforcing existing subfloors made of plywood or other wood products. Zinc plated to prevent any corrosion from water based patch or adhesive. Drive Screw Nails: 13 gauge nails designed to install carpet bar and other metal moldings in wood floors where the head of the nail remains visible. 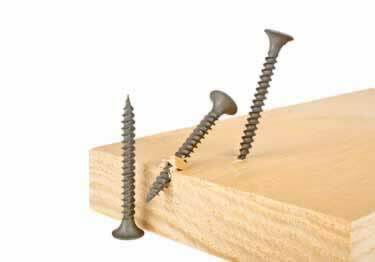 Grip and hold of these nails is optimized when the spiral shank of the nail is driven into the substrate creating a screw shaped hole, preventing the nail from coming loose and the substrate from crumbling around the nail. Great for use with particle board substrates. Available in gold or silver, drive screw nails have domed flat bottom heads and are designed to combine practical work with a decorative finish. Drive Screw Nails with 3/16" heads are designed to fit into countersunk holes, and the �" heads are designed to fit over the holes of metal moldings. Plasterboard Nails: 13 gauge shank with a large head provides smooth nailing. Blued and plated for rust prevention and a clean, oil free finish. Roofing Nails: 11 gauge large head roofing nails have electro galvanized coating to prevent rust. Primarily used in outdoor applications. General Purpose Concrete Nails: 12 gauge general purpose concrete nails have a smooth shank delivering an easier installation into concrete substrates while preventing the creation of an oversized hole. Designed with a countersunk head for a flush finish on the surface of the substrate. 11/16" nails is used as the standard pre-nail in carpet strip. Heavy-duty Concrete Nails: 10 gauge heavy-duty concrete nails are ideal for hard concrete installations where 12 gauge nails will bend or break. Available in 5/8", 3/4", and 1" for use in carpet strip installations. Extra Heavy Fluted Concrete Nails: 9 gauge extra heavy fluted concrete nails are a hybrid between a smooth and spiral shank nail. This fluted nail has 20% more surface area than a smooth shank nail, creating more holding power. Designed with vertical grooves or flutes to deliver extra hold when used in 1/8" predrilled holes and help prevent chipping. Created so that the flutes absorb the pressure from the concrete, allowing the concrete to grip the nails. Electroplated for cleanliness and rust resistance. Elasticel (Acoustical) Concrete Nails: 12.5 gauge, spiral shank nails designed for use in lightweight concrete. Spiral shank nails provide extra holding power when driven into lightweight elasticel or acoustical concrete.